This process is ideally suited to facing small components, since it allows a high degree of control over heat input and the positioning of the arc and weld deposit. In common with other arc surfacing methods, the GTA (TIG) process is amenable to automation. Acceptable levels of dilution are generally considered to be less than 15%. Suitable for most steels and good quality cast iron, oxy-acetylene may be used to apply most cobalt alloys and some iron base and carbide containing grades. It is not generally used for applying nickel base alloys. For steel components, braze-welding, a variation of the normal oxy-acetylene process, is used. This is to avoid dilution of the coating by melting the substrate, since the addition of iron to STELLITE alloys results in a reduction in properties. A larger tip than for steel welding is combined with an increase in acetylene flow, resulting in a softer flame with a carburising feather about three times the length of the inner cone. The flame is played onto the surface, keeping the tip of the inner cone just clear of the surface. A small amount of carbon is absorbed into the surface, lowering its melting point and producing a watery, glazed appearance known as 'sweating'. 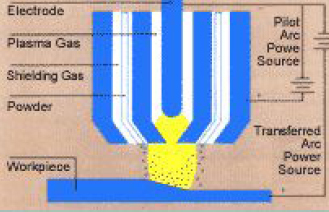 A rod is introduced into the flame, and a small drop melted off onto the sweating area, where it spreads quickly and cleanly, in a similar fashion to a brazing alloy. The MIG process is suitable for cobalt, nickel and iron base alloys. Carbide containing alloys can be deposited providing that care is taken not to generate dissolution of the carbides due to high arc energy. The process lends itself to facing small components, allowing a high degree of precision to be achieved, and is easily automated. The wires produced by DELORO STELLITE are available for spray transfer, pulse and dip transfer techniques. 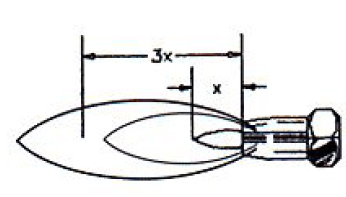 The submerged arc technique is suitable for cobalt, nickel and iron base alloys, but is not normally used for alloys containing carbide, since the high energy arc causes dissolution of the carbides. Using continuous wire, the process is ideal for large area coverage at hi surfacing speeds. Clean, porosity free surfaces are achieved at low cost, whilst multiple layers counteract the dilution effect. The MMA process, using coated electrodes, is suitable for facing heavy sections of substrate and for carrying out simple repairs in situ. Surfacing is normally carried out using DC electrode positive (reverse polarity) but the process may also be carried out with AC, using a power source with a minimum open circuit voltage of 80V AC and a slightly increased welding current. The electric arc causes greater than normal dilution of the substrate, softening and toughening the first layer of deposit which is particularly advantageous for impact resistance in such items as shear blades. If the recommended procedure is followed there is only a small degree of dilution of the second layer. Used for depositing nickel base and carbide containing alloys, it is also suitable for cobalt alloys, specially modified in powder form. The process is suitable for facing most steels, cost iron, nickel base and some copper base alloys.The powders used are applied at lower temperatures than rod, and the process is ideal for applications such as narrow beads or edge build up to provide small wear resistant areas, and for the surfacing of cast iron. The lower temperature results in slightly less scaling and distortion than with rod applications. 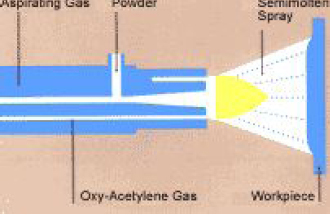 Spray and fuse is a two-stage process, the powder alloy being sprayed into position with a flame spray and then fused with an oxy-acetylene or similar torch, or in a vacuum furnace. The process uses specially modified cobalt and nickel base alloys and carbide containing grades of powders, depositing smooth, thin (I mm to 3mm) layers of STELLITE or DELORO alloys, metallurgically bonded to the substrate. PTA is suitable for all cobalt and nickel base alloys, iron base and carbide containing grades, using specially formulated surfacing powders, and is suitable for most steel and nickel alloy substrates. This is a true welding process, deposits forming a metallurgical bond with the substrate. Nickel and Cobalt based alloys available as castings, plate, bar and welding consumables for combination wear problems. * Stellite and Tribaloy are registered trademarks of Deloro Stellite Company Inc.
Deloro Stellite's cobalt base alloys are available as cobalt rods, cobalt electrodes, cobalt wire and cobalt powder. Cobalt alloys are used primarily for wear applications, our cobalt alloys can be applied by any known fusion welding process or HVOF spraying proess and are particularly well-suited for hardfacing applications. Cobalt alloys are the most widely used wear resistant hardfacing materials available. Their unique combination of wear resistance, strength and corrosion resistance make them adaptable to many harsh environments. Cobalt alloys are selected for their excellent resistance to the widest combination of wear types including adhesive wear, abrasion, erosion, contact fatigue, thermal shock, cavitation wear, corrosion and oxidation. The degree to which the cobalt alloys retain these properties assures their unique position in the wear technology field. These cobalt alloys exhibit excellent wear, galling, corrosion and erosion resistance. At high temperatures they retain these properties, while showing a high degree of hardness. For information on composition, physical properties, designations/specifications, thermal properties, and hardness data on our cobalt alloys, click here to view the alloy database. The Tribaloy family of cobalt alloys feature a hard inter-metallic Laves phase, dispersed in a tough matrix of eutectic or solid solution. They exhibit outstanding resistance to high temperature wear, galling and corrosion and are particularly suitable for use where lubrication is a problem. Chrome manganese electrode having excellent work hardened properties. Crack free deposit for rebuilding, reclamation of heavy parts made of carbon or 14% Mn steel. General purpose joining and surfacing and buttering alloys. High metal recovery 80 to 85 % approximately. Suitable for downhand (flat), vertical & horizontal welding position. High deposition rate, No slag removal, Non-hygroscopic coating, No pre-drying and longer shelf-life. Weld metal contains work hardening Cr-rich Austenitic deposit. IMPORTANT - Weld metal contains chromium carbide in hard & fine Martensitic Matrix of Austenite not recommended where machined finish surface is required may be ground finished. Suitable for Sand Chutes, dredge components, grizzly bars, screens, scrapper blades, bucket lips & teeth. Suitable for hardfacing railway point & crossing, crusher jaws, crusher hammers, blow bars, tooth crusher rolls, swing hammer, crusher mantles. - Particular suitable for fine particle (Wet & Dry) abrasion i.e. erosion. - Excellent abrasion resistant under low to moderate impact. - High metal recovery 80 to 85% approximately. - Suitable for downhand (flat), vertical & horizontal welding position.